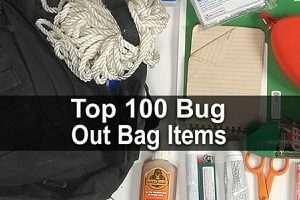 Of all the countless bug out bag lists I’ve seen on the Internet, I’ve only come across a couple that include a gun. 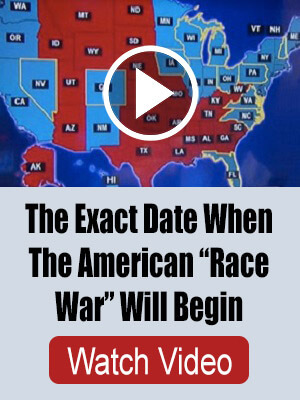 This is strange considering how important guns are for hunting and self-defense. The question is: What are the best guns to take along? No, not the best guns to have in your survival armory, but the best guns to take with you if you have to bug out. It’s an important distinction. If you’re going to bug out on foot, obviously you’re only going to be able to take one or two guns with you, and three at the most. On the other hand, if you’re going to bug out in your car, you could bring multiple guns with you, assuming your vehicle is large enough to carry everything you need. Either way, you’re still going to be very limited with the guns you can bring. While a Browning .50 caliber machine gun may be great to defend your homestead with, is that really a gun that you’re going to bring with you if you have to bug out? And to get even more serious, you have to be very strategic about which guns you bring with you. Take, for instance, the .22 rifle. There’s no question that a .22 rifle like a Ruger 10/22 is a highly versatile and practical firearm that belongs in virtually any firearms collection, and would be a great choice to have in an SHTF arsenal. But if you have to bug out, is a .22 rifle really a gun that you should bring with you? You could if you wanted to, but in all honesty, there are better options out there for you to consider, and that’s what we’re going to talk about. Easily the single most important gun for you to bring with you, bar none, is a pistol of some kind. This is probably the one firearm that is non-negotiable: you simply HAVE to bring a pistol with you when you bug out. It doesn’t matter whether you’ll be bugging out to a cabin in the woods, to a friend or relative’s house in another city, or wherever. A handgun is a must-have. Why the handgun? 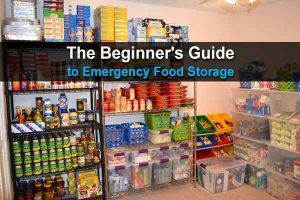 The answer is pretty simple: it’s concealable, and this is something that will be very important during any disaster scenario. Packing heat out in the open, whether it’s a pistol on your hip or a rifle or shotgun slung over your shoulder, is going to attract a lot of attention, the kind you really don’t want. Whether it’s from other people who will perceive you as a threat or law enforcement officers who you don’t want to mess with, keeping firearms out for everyone to see is not a smart thing to do. Instead, conceal carry, and keep all other firearms you have hidden. Invest in a high-quality holster that covers the trigger guard of the weapon, and never simply jam the pistol into your waistband as this will be very unsafe. You’ll also want to carry at least one or two spare magazines or speed loaders on your person at all times, too. A specific example of a make and model of pistol that would be great to carry is a Glock 19 in 9mm. Why? Because it’s reliable, large enough to fight with, small enough to conceal carry on your person, and it carries 15+1 rounds that make it a good choice for defending yourself against multiple attackers if need be. You can also carry a 17-round extended magazine (designed for a Glock 17) or a 33 round extended magazine as well. And remember, keep that pistol concealed on you at all times. The term ‘versatile rifle’ naturally implies a rifle that is, well, highly versatile. In other words, it’s a rifle that you can use for multiple different purposes such as defense and hunting. There are many good options here. One example, perhaps unsurprisingly, would be an AR-15. With a 20 round to 30 round magazine, it’s a great option for defending yourself against multiple attackers. Ammunition and spare magazines are widely available. The 5.56 round is also a great choice for defense and can be used to bring down certain sized game such as deer, boar, or pronghorn. Recoil is also very minimal on the AR-15, and range is superior (far superior, at that) to both a handgun or a shotgun. Another option to an AR-15 is the Ruger Mini-14, chambered for the same 5.56 or .223 round. Another choice would be the AK-47, chambered for the 7.62x39mm round with ballistics very similar to the .30-30 Winchester, and which would also be suitable for bringing down deer sized game. But at the same time, you may want a firearm that can tap out to even longer distances than the 5.56x45mm NATO or 7.62x39mm can, while also having more power to bring down bigger game such as elk. In this case, you’ll want to upgrade to the 7.62x51mm NATO or .308 Winchester round. And if you get a semi-automatic rifle in those calibers, it will still be a suitable choice for defense. If you have the money to spend, you can certainly get a high-quality firearm in the form of the DSL Arms FN FAL, Springfield M1A, or an AR-10 from a reputable manufacturer. If you’re on a more serious budget, for around half the price of an M1A you can buy a Century Arms C308, modeled after the HK G3 while being a little bit more crudely made (but you get what you pay for). But don’t think that you’re only limited to semi-automatics for a rifle that can be used for both hunting and defense. For example, you can go with a lever action rifle like the Winchester 1894 or Marlin 336 in .30-30 Winchester. Lever action rifles have a much faster rate of fire than bolt actions and usually carry more bullets, so they can be used defensively if need be. And since the .30-30 round has probably killed more deer than any other caliber in history, at least in the United States, you know it will be fine for hunting. Yet another option for you is the ‘Scout rifle.’ The Scout rifle is a .308 caliber bolt action carbine with a forward mounting optic. The idea is the rifle is big enough to hunt with but it small and light enough for close quarters use, such as in the brush. One of the most popular Scout rifles today is the Ruger GSR, which stands for Ruger Gunsite Scout Rifle. This rifle is chambered in .308 Winchester, as well as in other calibers like .450 Bushmaster and 5.56x45mm NATO. It’s based on the proven Ruger M77 action and comes standard with a 10 round magazine. While you may not think that a Scout rifle as described above would be a good choice for self-defense, the truth is that with proper training, it can prove to be an excellent choice for defense. In fact, one of the best training schools for using a Scout rifle defensively is the Gunsite Training Academy in Arizona. In short, the best rifle to bug out with is a rifle that can be used for long-distance shooting, self-defense, and big game hunting. It will be a more practical option than either a shotgun or a rimfire .22 rifle. Just try to keep the rifle hidden as best you can for the reasons we discussed above. If you’re bugging out via car, this will be easy. If you’re bugging out on foot, this will be much more difficult, but it can be done if you get creative enough. 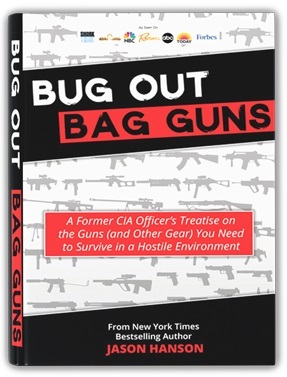 If this topic really interests you, I highly recommend checking out the book, Bug Out Bag Guns. It was written by Jason Hanson, a former CIA officer, and it is his treatise on the types of guns you need to survive while bugging out. He also talks about the gear that intelligence operatives and special forces soldiers use in the harshest of environments. 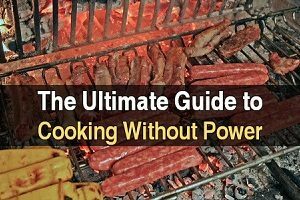 As of this writing, he is giving away his book for free to anyone who signs up for his newsletter (all you pay is shipping and handling), so get it while you still can. Ever tried to carry a lot of 9mm or 5.56 ammo? Bug out on foot and see how far you get. Stupid choices. A .22 will kill an animal, kill a human, and you can easily carry 2000 rounds in your bag. I have many guns in many calibers. My .22’s are my big out choice, both pistol and rifle. Under other conditions a 22lr will leave you wanting. Yes group, you’d be foolish to try to travel alone. I don’t carry a 22 for a CCW. So walking out I wouldn’t either. Having an additional 22 cal for long term I’m with that. Bugging out? Not so much. 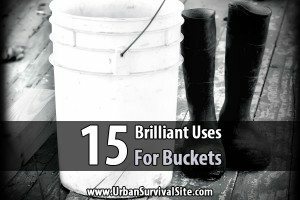 You can do very little with resources that are Not Available. Get real be prepared its a lot easier. A .22 is on my list for bug out. A large caliber rifle is great for hunting and defense, but a .22 and a brick of ammo gives you 2-3 chances at protein for six months.Due to personal preferences, I’ll not name types or brands, but an accurate .22 handgun or rifle of your choice is a necessity for bug out or inch bag IMO. In Journey Through Texas, Frederick Law Olmsted, writing about traveling the frontier in 1850, recommends to arm oneself with a pair of Walker Colts and a Sharps carbine. Says the combo can’t be beat for personal defense. A good shooter could reach out 100 yards with one of those old horse pistols and the larger Sharps rifles could go head to head with a Barrett. Pretty cool, no surprise the Indians lost. Carry a glock conceled and a 300 aac blackout 8 to 10 inch AR pistol with a telescopic brace. a 40 cal. carbine. The ammo would not be as common as 9mm and 5.56. Your advice would be appreciated. I’d want an AR/AK or equivalent at my BOL but not with me bugging out. I want to be a grey man. I don’t want to attract attention with a rifle slung on my back. I’d carry either a Henry AR-7, .22lr, semi-auto take down (16.5″ stored) or the Ruger 10/22 take down (20″ stored) with subsonic rounds. Add a 2-8x scope and you can take the eye out of a squirrel or zombie at 100+ yds. – and do it quietly.